Ascending Butterfly: Progresso High Fiber Soup Prize Pack Review And Giveaway! Progresso High Fiber Soup Prize Pack Review And Giveaway! This giveaway is now CLOSED. Thanks so much to our wonderful sponsor Progresso, (via MyBlogSpark), We look forward to working with you again! The winner has been notified and upon confirmation his/her follower name will be posted both here and on our homepage. Remember: There are still some great giveaways active on the upper right hand side of the page! Win Some Winter Time Comfort Food! While I'm a whiz at food for the soul, I'm sometimes not always as careful as I should be when it comes to food for my body! My diet is not as high in fiber as it should be, and I wanted to find ways to remedy that this year. I'm begining to 'get' the secret, because everytime I ask with purpose, when I am truly 'aligned' to the intention, lately the Universe has really responded! As if someone had read my mind, I received a box of comfort food that was also good for me in the mail! Progresso in conjunction with MyBlogSpark™ sent me their new Homestyle Minestrone High Fiber Soup, two bowls and two soup spoons. (I don't know how they knew I accesorize my Kitchen in that same color blue, but not only am I love with the soup, the bowls have become my new favorite!). The new high fiber soups from Progresso have 28% of your daily serving of fiber! Just what the Doctor ordered. And better still, it tastes GREAT! It is not bland, it is not boring, and I did not feel the need to 'doctor' it, which is what I usually end up doing to food I didn't prepare myself. Progresso’s High Fiber Soups include the Homestyle Minestrone, Creamy Tomato Basil, Hearty Vegetable and Noodle & Chicken Tuscany. The soups have no MSG and no artificial flavors. WIN IT! - Ascending Butterfly and our friends at Progresso and My Blog Spark want to help you get more fiber in your diet, the tasty way! 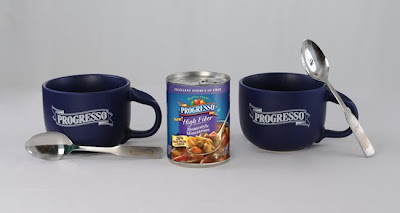 One lucky 'Ascending Butterfly' follower will have the chance to win a Progresso High Fiber Soup Prize Pack of their own! How to Win: (1) You must be a follower of Ascending Butterfly to be eligible for this and all giveaways. Indicate in your entry that you follow (if your 'comment name/user id' differ from your profile id, please let me know what name you follow under) and (2) Post a comment here telling me how you try to incorporate more fiber into your diet. (3) You must also leave your email address somewhere in your comment. (You can format it this way for security, example: ascendingbutterfly AT mail host DOT com). Please follow the easy 1, 2, 3 steps to winning! This giveaway is open to USA residents who are 18 years of age or older. This is NOT a paid endorsement/insertion. All opinions are expressly my own! Progresso via MyBlogSpark provided me with samples of the new high fiber soup line to review and are providing the prize pack for this giveaway. I'm a follower. I've really put more whole grains and veggies in my diet this year. I'm fuller faster and now a heck of a lot skinnier and healthier. I follow your blog(5webs), and I get lots of fiber in my diet because I eat lots of fresh fruits and vegetables, I eat a whole grain cereal for breakfast, and I use double fiber bread for my sandwiches which has 6 grams per slice. I follow. I try to eat lots of fruits and vegetables to incorporate fiber in my diet. I follow Ascending Butterfly on Networked Blog. I have a sandwhich for lunch almost daily (it's easy to take to work), and only buy high fiber wheat bread. It tastes better, and it's good for you! I try to add vegetables to every lunch and dinner to try to get more fiber in my diet. Thanks for the chance. I have cut out all white breads and now only buy high fiber, multi grain breads. Not only is it tastier, it's healthier. Hubby loves beans, any kind of beans and he makes them a lot. They are very high in fiber and he is big on having fiber in our diets. We eat lots of soup beans and they are economical also. Your button is in my blog post and at the bottom of my blog with all my other cute little buttons. I am following you on twitter and I tweeted your contest. I have been subscribed to your emails and love keeping up with your blog. I try to incorporate more fiber into my diet by eating fresh fruits, vegetables, and whole grains :) *Thanks* for the giveaway! 1. I am a follower of the AscendingButterfly blog. 2. I am adding more fiber to my diet by putting ground flaxseed in my breakfast cereal. I am a subscriber to the AscendingButterfly email newsletter. I'm planning to add more fiber to my diet by eating more vegetables. I voted on Fuel My Blog. I follow on Facebook (Laura Hulke Wales). 1. I follow your AscendingButterfly blog. 2. I add lots of fiber to my diet by eating a lot of fruits, vegetables and whole grains. I'm subscribed to the AscendingButterfly emails. I've been adding a lot of veggies to my diet this year to help with fiber. I follow&we add it by veggies and beans to help get enough fiber! I eat Fiber One cereal, thanks! I eat high-fiber cereals for breakfast! I try to eat lots of fruits and veggies! oh, and lots of popcorn - yum! I follow. I eat wheat bread and high fiber cereal. I would like to eat more fruits for fiber. I am a follower. i try to eat more veggies and fruit to incorporate more fiber in my diet. I follow. I add fiber by eating whole grains. danvice at yahoo dot com. I follow your blog. I try to incorporate more fiber into my diet by eating more fruit and vegetables. This is a wonderful giveaway! I'd love to win! Progresso makes great products! I love to "sneak in" uncooked oats into recipes like meatloaf, spaghetti sauce, casseroles and desserts. I even stir it into peanut butter for PB&J sandwiches! I eat more multi-grain foods. I follow your blog with google friend. I get my fiber through cereals like Fiber One. I am your Google Friend and I get your e-mails. I try to get fiber through the foods I eat -- beans, nuts, and salads mostly. I try to incorporate more fiber by eating more fruits & vegetables as well as whole grain breads.